It was a relatively straightforward victory at Old Trafford today against the baggies. Last season, West Brom were the only team to take a point at the theatre of dreams. There was no danger of a repeat today as United were completely dominant and were unlucky not to have won by a greater margin. With Rooney, Chicharito, Welbeck and Ashley Young all threatening, West Brom did well to escape without a hiding, particularly after they went to ten men in the second half. 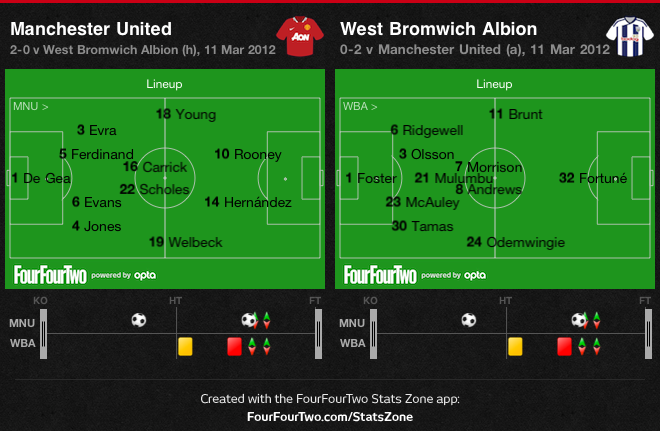 The graphic above (click to enlarge) shows United lining up in a 4-4-2 formation. In fact, as we see from the player influence chart (below), it was more of a 4-3-3 which actually ended up being a 2-4-4 as the reds piled forward. Evra and Jones played the wings, Welbeck tucked in ahead of Carrick and Scholes, while Young made a three up front alongside Rooney and Chicharito. But it was also a very fluid formation which allowed a lot of positional interchange between the United players and helped to create plenty of varied shooting angles for the attackers. Rooney managed to squeeze of six shots, scoring twice; Hernandez had 4 shots, as did Ashley Young, and Welbeck, playing deeper today, had 2 shots. That amounts to 16 shots from the four attackers. 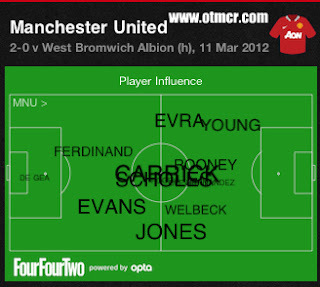 In midfield, Carrick and Scholes were once again dominant. Carrick, playing slightly further forward and noticeably more to the left, topped the passing stats as he does every week. 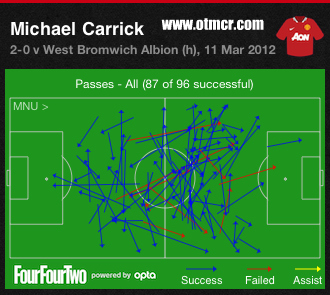 87 of his 96 passes were successful as we see from the chart. Scholes, meanwhile, completed 75 of his 86 attempts. Jonny Evans was third in the passing stats behind the midfield pair. In fact United players accounted for 10 of the top 12 passers today. It was an impressive passing display from the team and possibly contained a few clues as to how United will approach the match in Bilbao next Thursday. Having been overrun by the Spaniard's midfield at Old Trafford, Sir Alex may opt to play an extra body in the centre for the second leg and hope to achieve the same balance of discipline and fluidity that has long been a trademark of United sides.